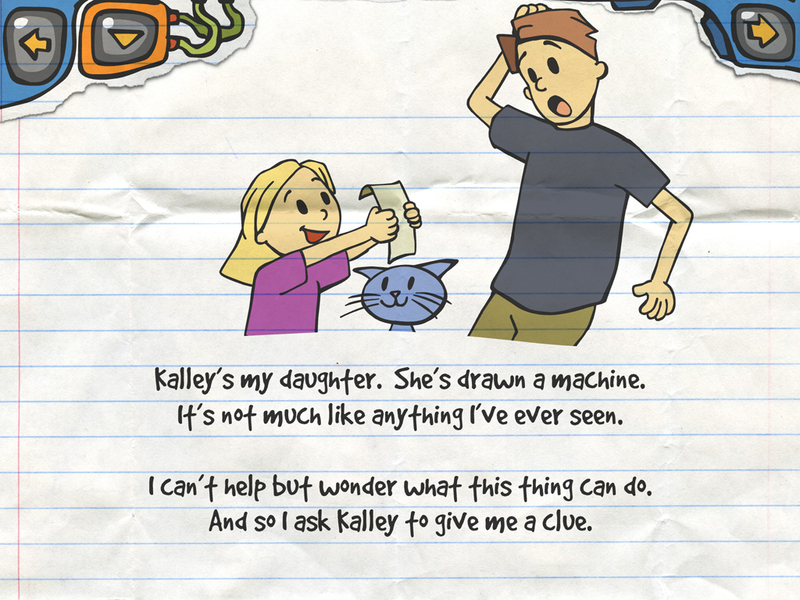 Kalley’s Machine Plus Cats is the super-fun interactive story about a 4-year-old girl’s drawing and her heartwarming plan to save her dad from his daily commute. Chosen as one of the Best New Apps on the App Store! 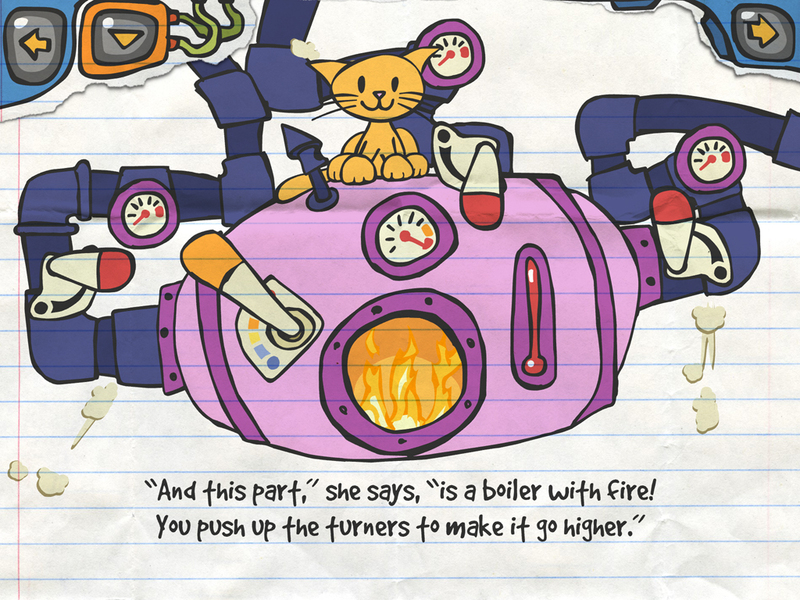 Kalley’s machine is riveting to explore, ingenious in its creative engineering and fascinating to use because it has multiple interactive hotspots that interrelate on each page. 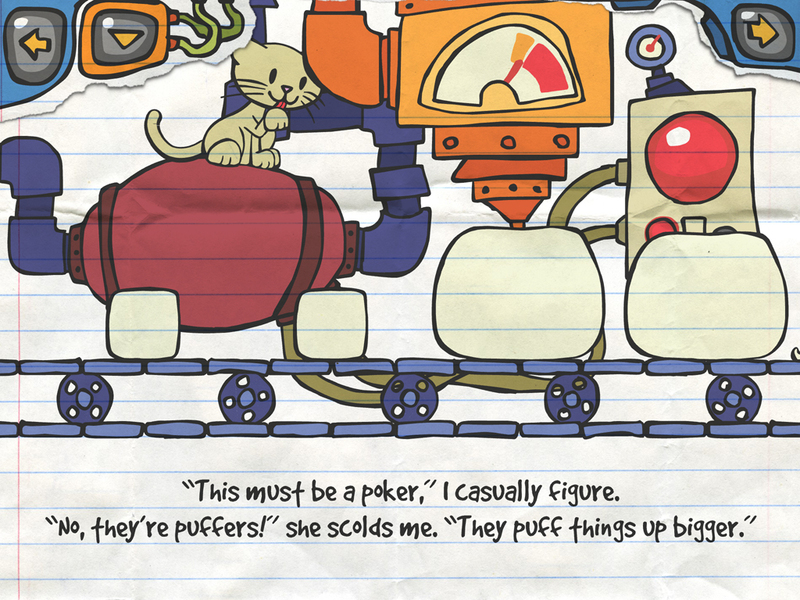 This app showcases some of the most elegant interactions ever placed inside of a kids’ book app. 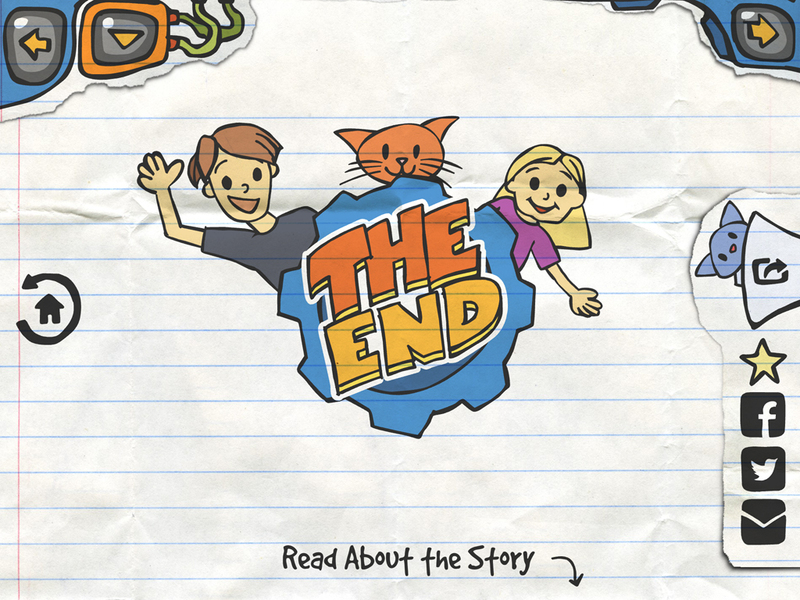 This storybook app invites kids to tap and explore and discover — it’s a delight for all ages. 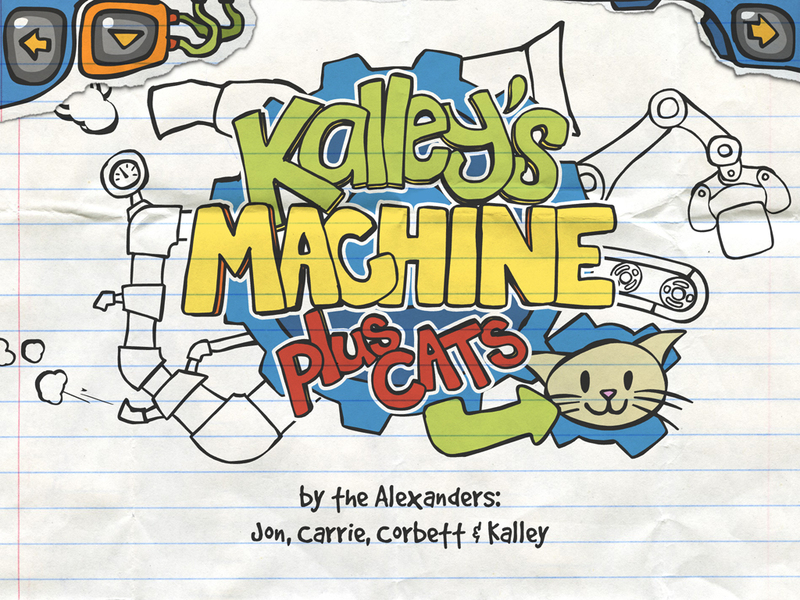 Kalley’s Machine Plus Cats is a delightful interactive book that kids will want to read, or at least explore, over and over. 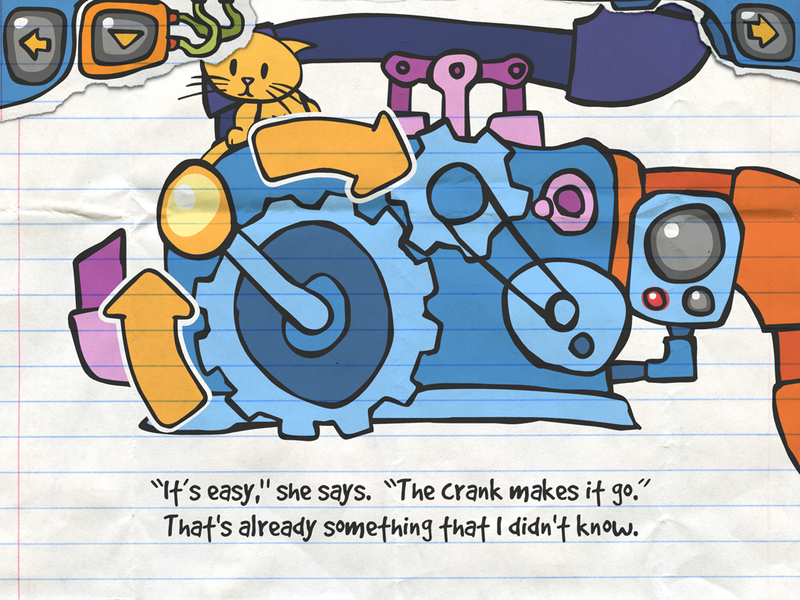 I am so very impressed with the wonderful and witty machines found in Kalley’s Machine Plus Cats as well as the overall quality of this app. 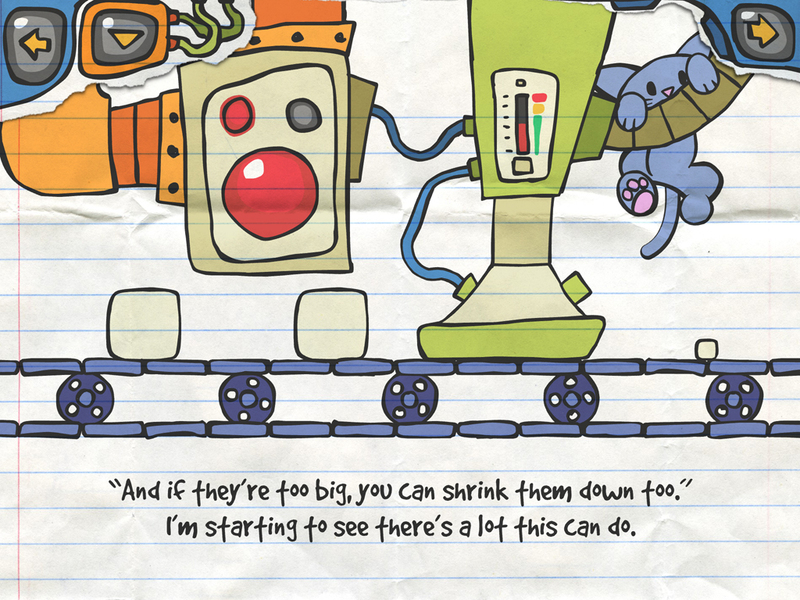 This app gives me a renewed interest in testing children’s applications and is a very easy application to recommend. 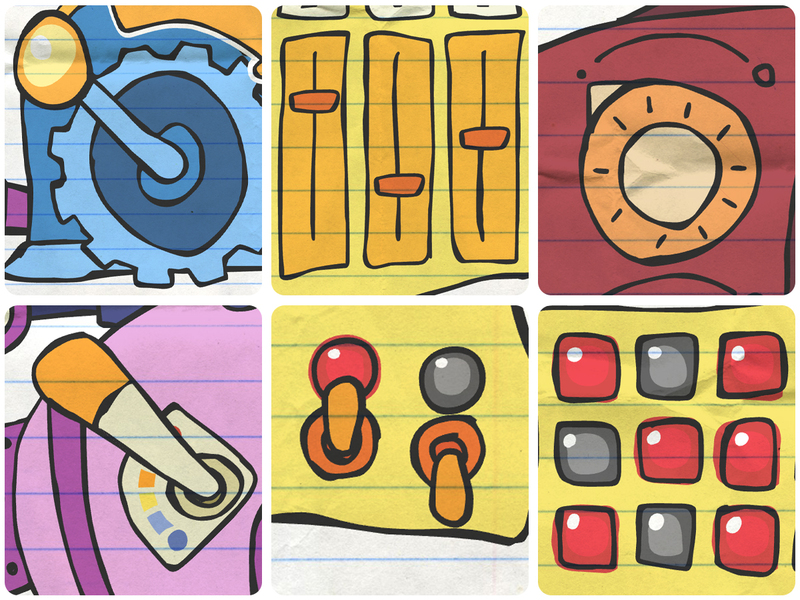 Kalley’s Machine is dear to our family because it is based on the true story of how we started making apps together. 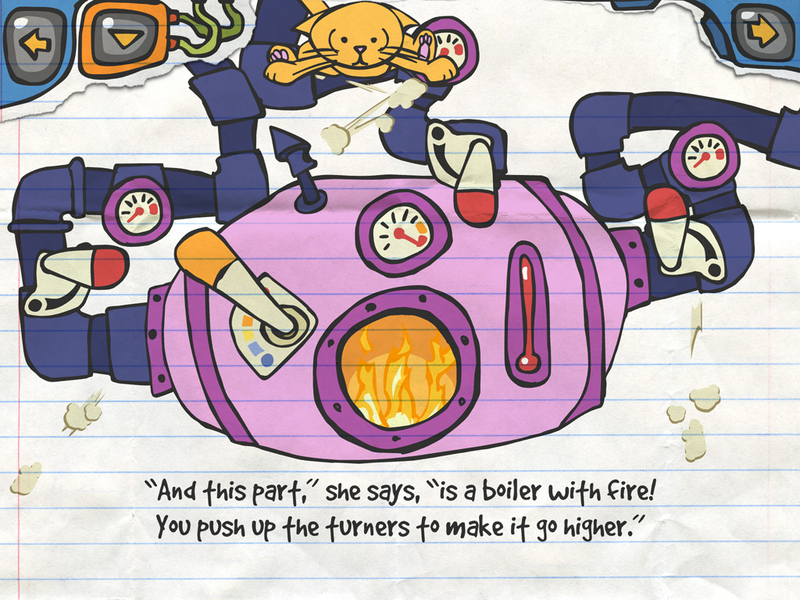 When our daughter Kalley was 4 years old, she drew a picture of a machine. She was super-excited about it and took it everywhere she went. It took us a while to catch on to the fact that she had drawn it in answer to a new development in our family. We had explained that daddy had taken a job downtown and soon would be commuting everyday. She was not cool with this. She was used to daddy working from a home office. But we explained that grown-ups need to work for money so we can trade the money for things our family needs – like food. 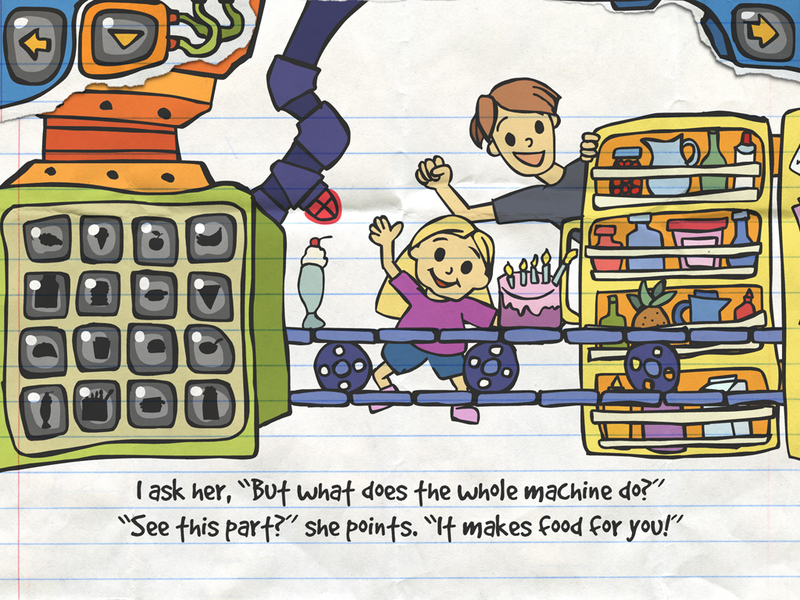 Kalley’s answer was to draw up plans for a machine – a machine that could make food – thereby eliminating the need for money and for daddy to go away to work. 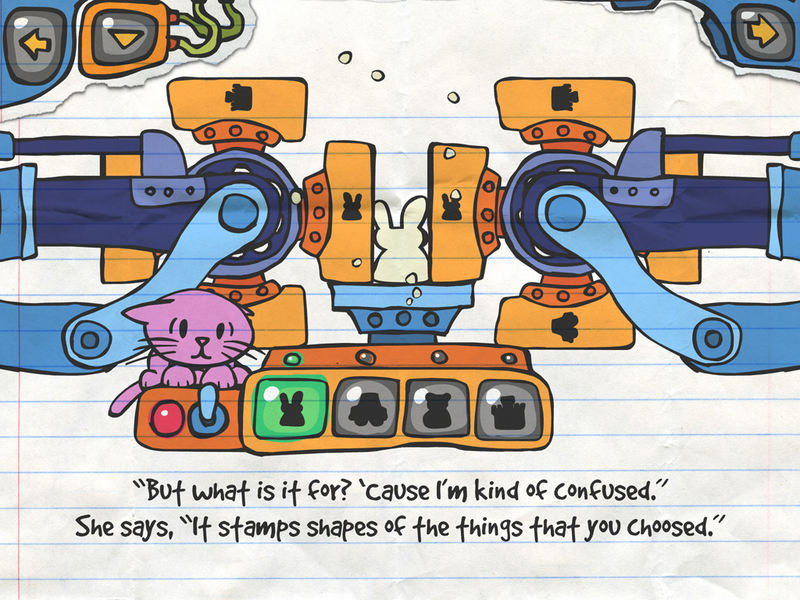 And while building the machine Kalley drew was a no-go for several reasons, we loved the heart behind her drawing. 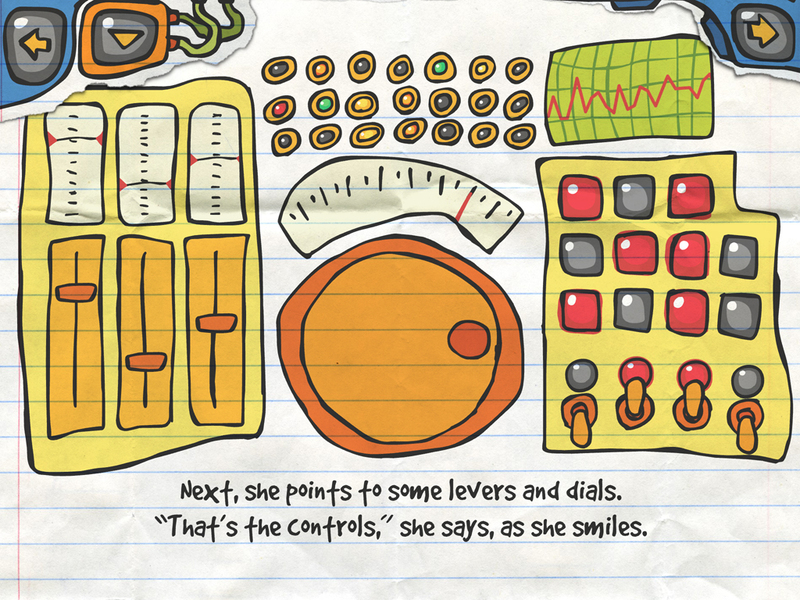 And we decided it could make a great interactive story that we could build together and sell as an app – so maybe someday daddy wouldn’t have to go away to work. PRO TIP: Print them all out for a free storybook! 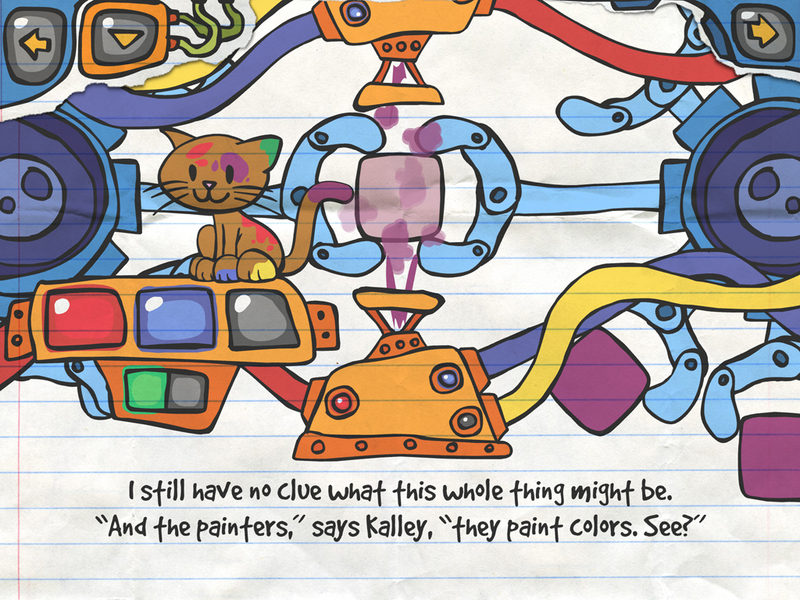 Kalley’s Machine is a story based on a 4 year-old girl’s drawing. 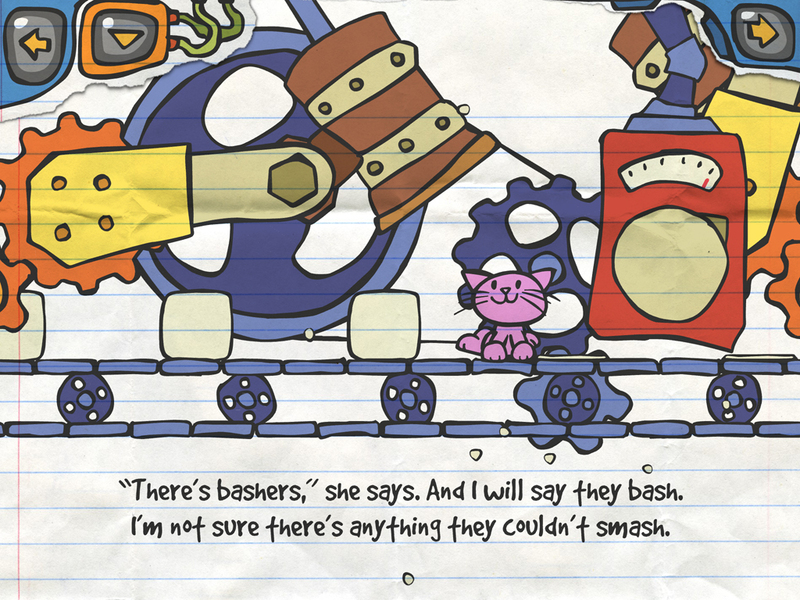 As such, it includes cats. They are completely irrelevant to the story. However, they are way fun to harass. Tease them. Scare them. Puzzle them. Adore them. We think you’ll love the cats. Kalley and her dad narrate the story with highlighted words so kids can follow along. Words are spoken when kids touch them. 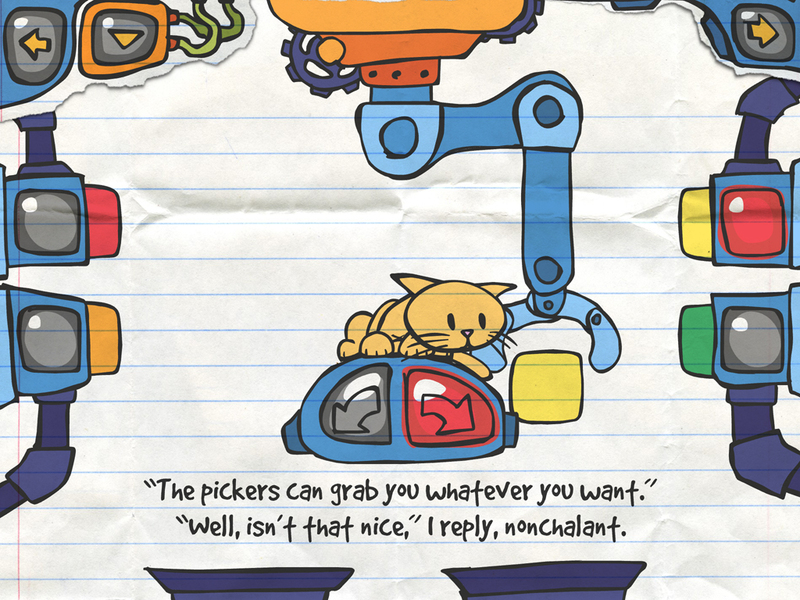 Honestly, this app is not designed to be educational. It is designed to be fun. 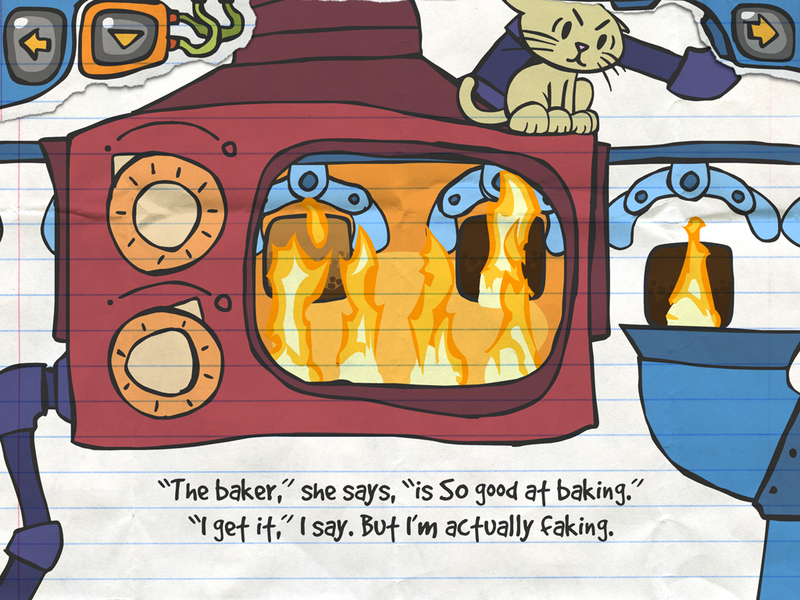 However, we’d get an ‘F’ in marketing if we didn’t point out that the interactive medium offers kids great chances to explore some basic concepts which are both safer and less messy than their real-world alternatives. WARNING: This story makes a single use of the word “nonchalant”. It was written in a moment of desperation to find a rhyme with the word “want.” We realize that’s a pretty poor excuse. We also realize that, in the way we used it, it really should have been “nonchalantly”. It was just pretty sloppy all around. So, if you feel like a word that advanced has no place in a book for little kids, we completely understand. In fact, we mostly agree (except that it’s so mind-crushingly hard to think of a contextually appropriate rhyme for “want”). And if that is going to wreck it for you, then we’ll understand if you don’t buy our story. Just don’t buy it and get in there later and be like, “What is this ‘nonchalant’ business? !” We’re having this talk now.